For the backyard beginner or small-scale commercial poultry producer. 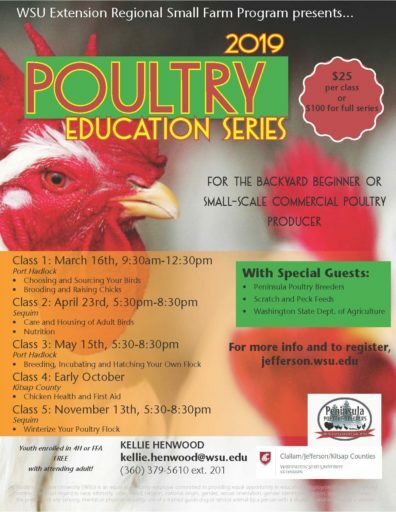 Join WSU Extension’s Regional Small Farms Program and Peninsula Poultry Breeders Association for this educational series for poultry growers. This series is intended for those who want to deepen their knowledge in raising poultry from the backyard beginner to the small-scale commercial poultry producer. We are offering 5 classes throughout the year. Please note that each class will take place in a different location (Clallam, Jefferson and Kitsap County locations). COST: $25 per class per person, or $100 for the full series paid in full ($25 off!)*. Youth enrolled in 4H or FFA may attend for free with an attending adult. Register for Class 1 or Entire Education Series here. Register for Class 2 here. Register for Class 3 here. To register for Class 1, choose the option for March 16th. To register for the full series, choose the whole series option. Other single class registration links will be live. *In order to receive the discount, you must register before or on March 16th. No refunds or prorated rates are offered on the discount after March 16th. Would you like to receive periodic email updates about classes, workshops and resources offered from WSU? Join our Agriculture listserve! Email Kellie Henwood with you contact info indicating which county you live/farm in. We’d love to help you!